LSU Law’s team of Jessie Finley, Sara Kuebel, and Jacob Cunningham won the 2018 John R. Brown National Admiralty Law Moot Court Competition in Seattle on March 24. The national-championship-winning team also won the competition’s Maritime Law Association of the United States Award for the Best Brief. Travel to this year’s competition was underwritten by a grant from the Houston Marine and Energy Insurance Conference. With wins in 2015 and 2016, LSU Law has won three of the last four national championships at the Admiralty competition. LSU Law advanced to the semifinal round of the competition in 2017. The Judge John R. Brown Admiralty Moot Court Competition is an interscholastic appellate moot court competition sponsored each year by The University of Texas School of Law. More than 30 teams from law schools across the country face off in the annual competition. 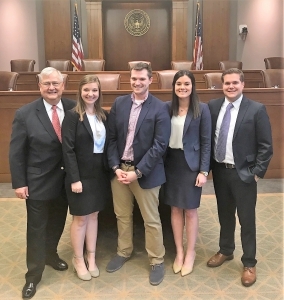 The Law Center’s John R. Brown National Admiralty Law Moot Court Competition team is coached by Adjunct Professor Dean Sutherland (LSU Law ’75) of Jeansonne & Remondet and Phillip Smith (LSU Law ’16) of NeunerPate. The Law Center’s “Gold” team (students Josie Serigne, Clint Smith and Mary Kathryn Gimber) advanced to the Quarterfinals, and team member Josie Serigne was ranked as the 13th highest oral advocate overall at the competition. This title marks the third national championship for LSU Law’s moot court and trial advocacy teams this academic year. LSU Law students Zach Miller and Max Roberts were crowned champions of the Manfred Lachs Space Law Moot Court Competition’s North American regional rounds in Washington, D.C., also on March 24. Participating for the first time in the competition, the team also took home the award for Best New Team. LSU Law won the Peter James Johnson National Civil Rights Trial Competition on Oct. 22 at St. John’s University School of Law in New York City. LSU Law also finished second at the National Environmental Law Moot Court Competition at Pace University in White Plains, N.Y., on Feb. 24. 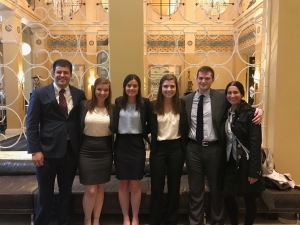 LSU Law’s Admiralty Purple and Gold teams of, from left, Clinton Smith, Jessica Finley, Sara Kuebel, Mary Kathryn Gimber, Jacob Cunningham, and Josie Serigne.